Здесь представлена один из разделов пятой главы каталога, сопровождавшего выставку работ художника эпохи Возрождения Фра Анжелико (15 век) в Музее искусств Метрополитен в Нью-Йорке в 2005 году.. Каталог составлен кураторами этой выставки Лоуренсом Кантером и Пиа Палладино. The latter is dominated by the figure of Christ enclosed in a mandorla of cherubim and seraphim and flanked by a heavenly tribunal that includes the Virgin Mary and Saint John the Baptist, the apostles, two Evangelists, Saints Dominic, Stephen, Gregory, and Benedict, and a choir of angels. Below Christ, separated by a row of open tombs, are the blessed, being greeted by their guardian angels, and the damned, being dragged into Hell by devils. In the left panel, mostly Dominican saints are being led through a flowered meadow up to the gates of Paradise, suggested by lines incised into the gold ground. Directly below the gates, a bearded Augustinian saint, presumably Saint Augustine, appears to be pointing to the arrival of a pope and a Dominican cardinal accompanied by an angel. In the right panel, below the saints and angels, is the mountain of Hell, divided into distinct zones based on Dante's vision in the Divine Comedy. Latin inscriptions identify the vices depicted, beginning with SVPERBIA (pride), which encircles the head of Satan. To the left and right of Satan, from the bottom up, are the avaricious (AVARY) and the lustful (LIBIDINOSI), the wrathful (IRACVNDI) and the envious (INVIDI), the indolent (ACCIDIOSI) and the gluttonous (GVLOSI). 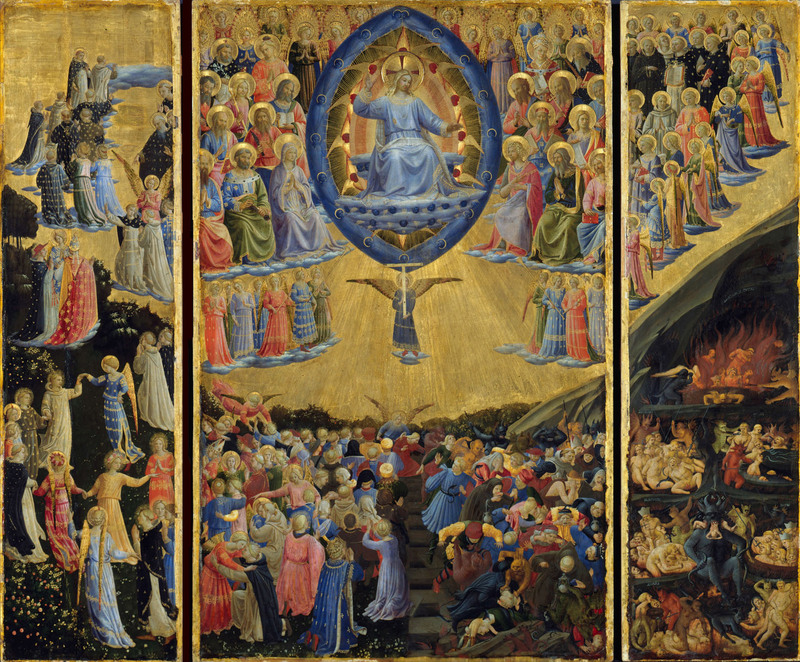 The Berlin Last Judgment is first recorded, with an attribution to Fra Angelico, in the famous Roman collection of Cardinal Joseph Fesch (1763-1839), who had reputedly acquired the panel from a baker. (*2) It was subsequently owned by Prince Charles-Lucien Bonaparte (1803-1857), a nephew of Napoleon I, and then by the English collector Lord Ward, Earl of Dudley, who sold it to the Konigliche Museum (now the Gemaldegalerie) in 1884. In the 1898 catalogue of the paintings in Berlin, Bode pointed out the existence of an exact copy of the image (fig. 92), by the Netherlandish painter Bartholomaeus Spranger (1546-1611), in the Galleria Sabauda, Turin. Other versions include the fresco in Orvieto Cathedral (fig. 93); the center panel of a triptych in the Corsini Collection, Rome (Galleria Nazionale d'Arte Antica di Palazzo Corsini, Inv. 395-396-397; fig. 94); and the depiction on the Annunziata Silver Chest (fig. 95). Of these, the Corsini Last Judgment has been singled out by most authors as the most comparable, both stylistically and compositionally, to the Berlin painting. According to Baldini, Spike, and Bonsanti, both works were painted during the artist's first Roman period, between 1447 and 1448. A close relationship between the two panels has also been proposed by Mauro Minardi,(*8) who, however, views the Berlin version as slightly earlier in date, stylistically nearer to works from the first half of the 1440s than to the artist's Roman production. 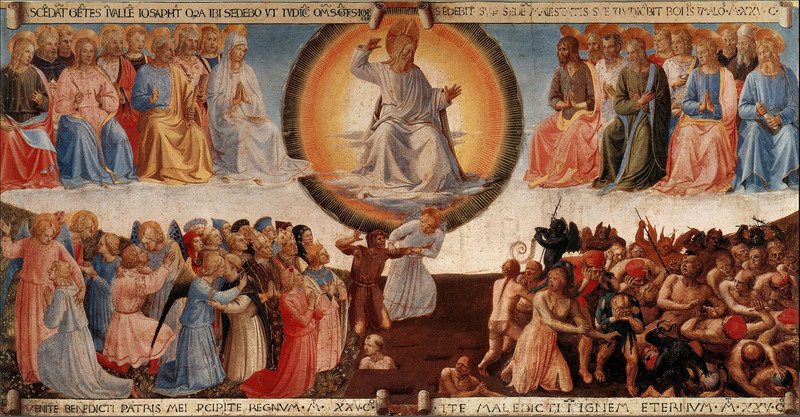 It is difficult, in light of its present condition, to ascertain the extent to which the original composition of the Corsini Last Judgment might have corresponded to that of the Berlin version. Common to both works are such details as the crossbearing angel, isolated below Christ, and the single row of open tombs vanishing in the distance. On the other hand, whereas the Corsini panel shows Christ holding a book inscribed with the letters alpha and omega (the beginning and the end) in his left hand, in the Berlin Last Judgment the focus is entirely on the gesture of condemnation. 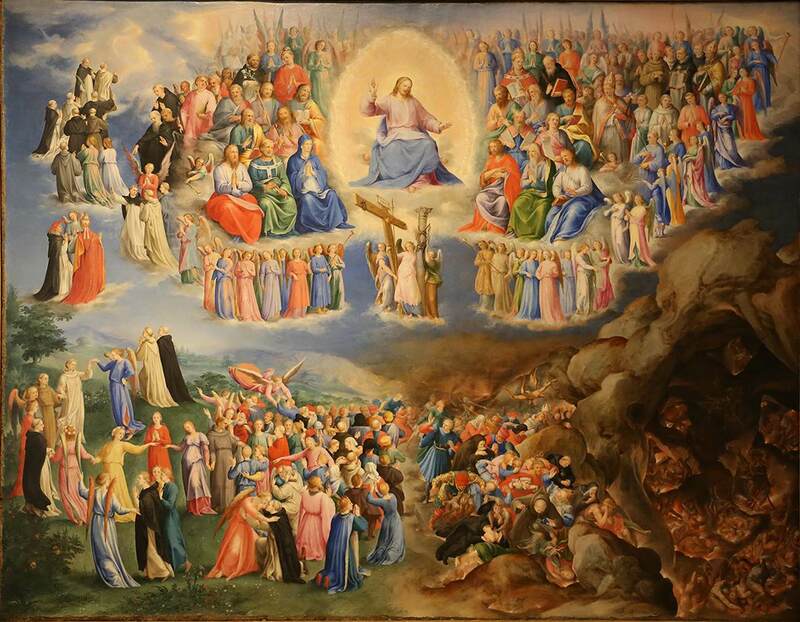 Absent also from the Corsini Last Judgment are the choir of angels below the heavenly court and the fiery red seraphim and blue cherubim articulating Christ's mandorla. In this respect, the Corsini painting is closer iconographically, as much as stylistically, to the spare, more reduced versions in Orvieto Cathedral and on the Annunziata Silver Chest, where Christ is shown against a luminous, uninterrupted heavenly light. In its brilliant coloristic effects, as well as in the descriptively detailed visions of the entrance to Paradise and of the torments of Hell, the Berlin picture, on the other hand, more nearly approaches Angelico's famous Last Judgment for Santa Maria degli Angeli. Generally dated to 1431-32, although possibly painted almost a decade earlier (see p. 80), the Santa Maria degli Angeli panel has been viewed as Angelico's creative adaptation of traditional fourteenth-century prototypes of the Last Judgment, as represented in particular by the Camposanto frescoes in Pisa, from which the artist derived the vivid, Dantesque vision of Hell. 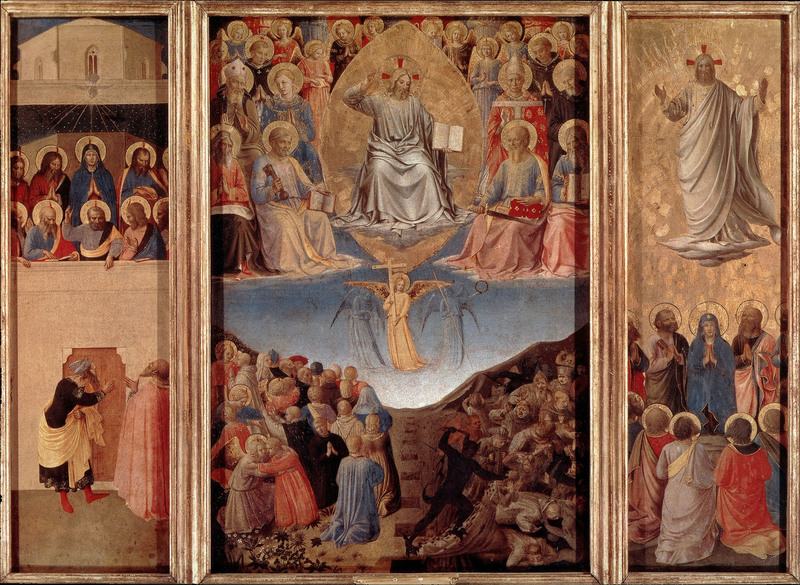 Stylistically, the Berlin LastJudgment may be compared with works produced by Angelico in the mid- to late 1430s, in which one finds the same rounded figures, in contrast to the more attenuated forms that distinguish the paintings from the next decade, as well as the brilliant palette and precious decorative effects. The intensely emotive quality of the gestures and facial expressions that distinguishes the tumultuous crowd of fleeing and persecuted souls brings to mind, in particular, the narrative vivacity of the predella to the Linaiuoli tabernacle (cat. 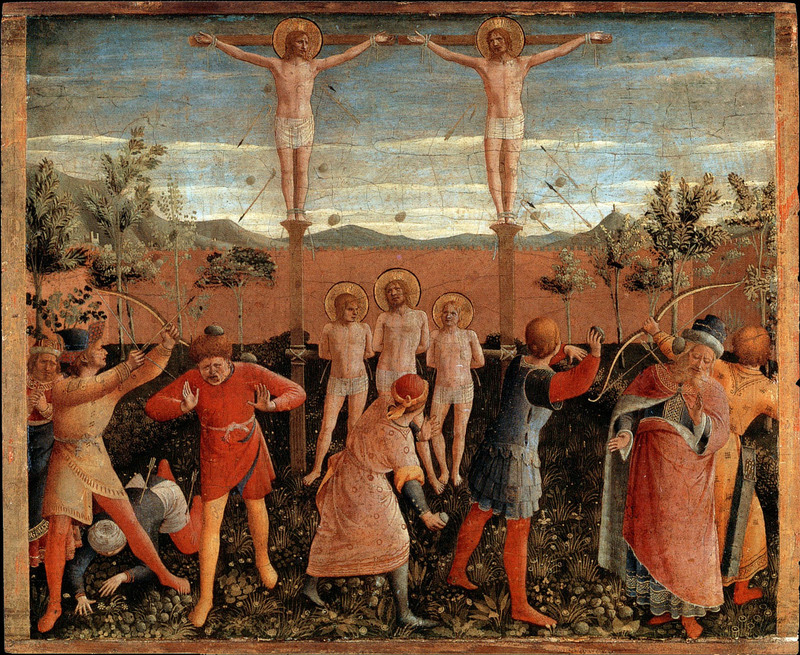 29), as well as the dramatically charged scenes — most notably, The Attempted Martyrdom of Saints Cosmas and Damian - of the later San Marco altarpiece (fig. 118). The most stringent comparisons, however, may perhaps be found in the small Virgin and Child in the Pinacoteca Vaticana (fig. 91), dated by Kanter (p. 106) to the second half of the 1430s, which is characterized by nearly identical figure types and by a similar loose handling of forms and sketchier definition of facial features. Dating the Berlin Last Judgment between 1435 and 1440 raises several possibilities with regard to its patron, who, as suggested by the overriding presence of Dominicans among the blessed, was most probably a member of that order. Bode's identification of him as the Dominican cardinal prominently situated next to a pope in the upper left of the garden leading up to Paradise(*19) deserves proper consideration, especially in light of the pointing gesture of Saint Augustine, clearly directed at them. Given the painting's execution during the pontificate of Eugenius IV (r. 1431-47), it may be safe to presume that he is the pope shown with his back to the viewer (and thus probably not the picture's patron).The role accorded Saint Augustine might be explained in terms of Eugenius's first affiliation with the Augustinian order, as a former canon of San Giorgio in Alga in Venice. It is tempting to speculate, in this context, that the cardinal depicted here might be the famous Juan de Torquemada, who received the title in Florence in 1439, and who would later commission the Christ on the Cross now in the Fogg Art Museum (cat. 39). Barring such a late date for the painting's execution, the remaining possibility is to identify the patron with the only other known Dominican cardinal during the reign of Eugenius IV, the Spaniard Juan de Casanova of Aragon, who, like Torquemada after him, held the title of Magister Sacri Palatii (master theologian of the Vatican palace), received the cardinal's hat in 1431, and died in Florence in 1436. 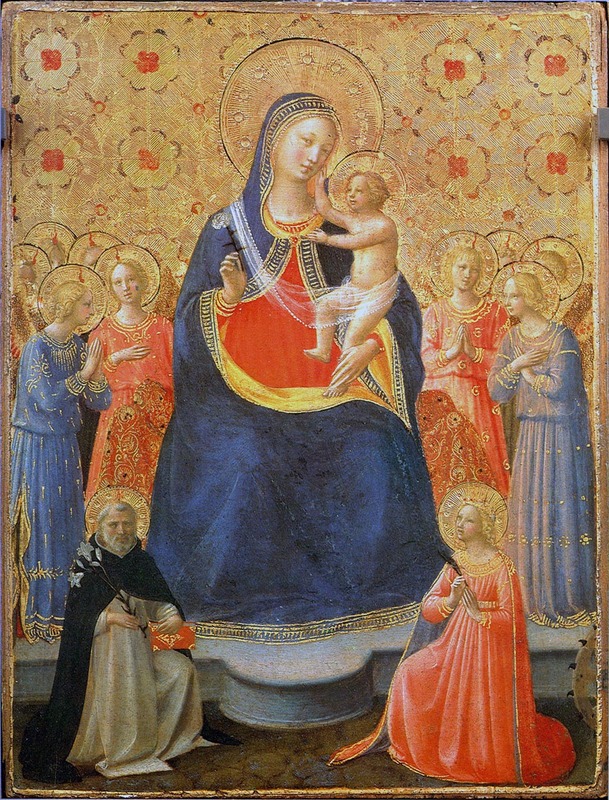 (*20) Regardless of the cardinal's identity, most likely the painting was commissioned in Florence, during the pope's prolonged residence in the Dominican convent of Santa Maria Novella, between 1434 and 1436, and again between 1439 and 1443. (*21) The fact that Spranger's copy of the Berlin Last Judgment was executed in Rome for a Dominican pope, Pius V, suggests, however, that the painting may have been intended to decorate a cardinal's private chapel or residence in the same city, perhaps located in one of the two major Dominican convents, that of Santa Maria sopra Minerva or of San Sisto. (*1). As reported in Staatliche Museen Preussischer Kulturbesitz 1978, p. 27. (*2). Fesch collection, 1841, no. 565, p. 27; Konigliche Museen zu Berlin 1898, pp. 8-9. (*3). It is worth noting that the earliest descriptions of the Berlin Last Judgment, in the 1841 Fesch catalogue and in the 1864 edition of Crowe and Cavalcaselle (vol. I, p. 587 n. 3) appear to refer to a continuous, uninterrupted composition, albeit "altered in form and impaired by some retouching" (Crowe and Cavalcaselle).The hypothesis recently proposed by M. G. Ciardi Dupre Dal Poggetto (1996, pp. 140-41) that the Berlin picture may be identified with a tondo, presumably of the Last Judgment, which is listed without attribution in the 1492 inventory of the Medici palace, fails to convince on both technical and circumstantial grounds. (*4). Bona 1909, p. 74. (*6). To Spranger's copy perhaps may be added a mysterious panel of the Last Judgment (to my knowledge never published) in a private collection in Sicily, which was first cited by Crowe and Cavalcaselle (1864, p. 588 n. 1) as a much repainted, contemporary replica of the Berlin painting. According to these sources the painting, then in the Capuchin church at Leonforte, near Catania, was the gift of the Branciforti Trabbia family. The 1931 Staatliche Museen zu Berlin catalogue notes that the same panel, then owned by Baron Lidestri of Artesinella, appeared for sale in Rome in 1914. (See also Pope-Hennessy 1974, p. 221; Staatliche Museen Preussischer Kulturbesitz 1978, where it is stated that the painting, in a private collection, was on loan to the Museo Civico di "Castello Ursino," Catania, in 1970.) I have not been able to see or obtain a photograph of this work.The present curator of the Museo Civico, Anna Quartarone, kindly informs me (written communication) that the painting was on loan from the Li Destri di Raine family between 1956 and 1972. It was then sent by the owners to the Istituto Centrale per it Restauro in Rome for technical examination. Nothing is known of the panel's sub-sequent history or location. (*7). Spike 1996, p. 193 (with earlier bibliography). (*8). M. Minardi, in Toscano and Capitelli 2002, pp. 176-79. (*9). Crowe and Cavalcaselle 1864, pp. 587-88; Schottmiiller 1911, p. 234. (*12). The Pentecost and the Ascension also appear to be fragmentary and may be assumed to have been reduced substantially in width. Each scene includes only a fraction of the number of figures normally required to appropriately illustrate the textual sources, and several figures in each are cropped inexplicably at the lateral edges of the composition. (*13). The entire estate of Sommaia, located about fourteen kilometers north-west of Florence, was bequeathed to the Dominicans at San Marco by del Pugliese, who specified in his will that he was leaving to the chapel and church of Sant'Andrea at Sommaia,"five pictures painted on panel ... that is: a picture on which is painted a head of Christ made in Flanders, with two wings at either side, painted by the hand of Filippo di fra Filippo; and a picture on which is painted a Judgement painted by the hand of Fra Giovanni, with two wings at the side, painted by the hand of Sandro di Botticello; and another picture on which is painted the Transition of Saint Jerome, by the hand of the aforementioned Sandro; and another small painting, by the hand of Pesellino; and another large painting, by the hand of the aforementioned Filippo, where is painted the Nativity with Magi" (as cited in Burke 2004, p. 159 [with earlier bibliography]).The hypothesis that the Corsini Last Judgment is the painting owned by del Pugliese was first advanced by C. Gamba (1936, p. 165), who identified as its lateral panels two paintings by Botticelli now in the State Pushkin Museum, Moscow, of the Angel of the Annunciation and the Virgin Annunciate, and two other works by the same artist in the State Hermitage Museum, Saint Petersburg, of Saint Jerome in Penitence and Saint Dominic Preaching. Gamba's suggestion was considered plausible by R. Lightbown (1978, pp. 94-96), who, however, accepted only the Pushkin paintings, the dimensions of which closely correspond to those of the Corsini picture, as the lateral panels in the proposed reconstruction.The del Pugliese document has been ignored, to my knowledge, by Angelico scholars. (*14). Referring to del Pugliese's apparent predilection for surrounding small works by renowned older masters with lateral panels by younger contemporaries, J. Burke (2004, pp. 175-76) has suggested that by this date a painting like Angelico's Last Judgment may have attained the status of an icon, to be protected as something sacred and precious. (*15). Gilbert 2003, pp. 46-47. (*16). Traversari's possible role in determining the iconography of the painting was also highlighted by A. Santagostino Barbone (1989, pp. 272-73). (*17).The principles underlying Thornist thought about the Last Judgment, and their influence on the Orvieto frescoes, in particular, are eloquently discussed by E. Paoli (1996, pp. 65-77, esp. pp. 66-67). (*18). Baschet 1993, p. 366. (*19). Bode 1888, p. 473. (*20). Eubel 1960, vol. 1, p. 34 n. 8, vol. II, p. 7 notes 1-2. (*21). For the various relocations of the papal court during this period, see ibid., vol. II, p. 7 11.4.